On March 10, 1797, a researcher published a study describing some strange bones that had been found in West Virginia, USA. He attributed them to an unknown animal, which he named megalonyx (or “great-claw”) and compared to a lion, except that its size should be more than three times greater. And he suggested that perhaps it could be found in the then unexplored territories of western and north-western North America. Today we know that there are no 12-feet tall lions in North America. 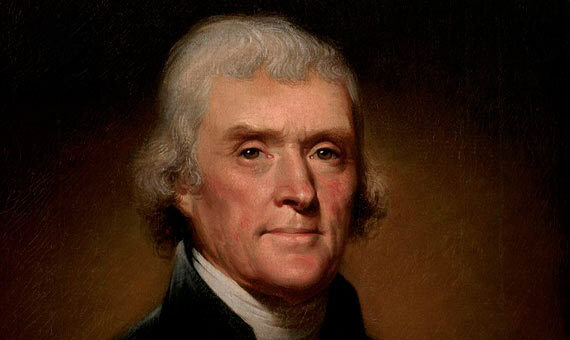 That study would not deserve a special mention beyond the discovery of the bones, if not for the name of its author: Thomas Jefferson (1743-1826), founding father of the United States, principal author of the Declaration of Independence and the man who would become, two years after the publication of that study, the third president of the nation. When he read his work in Philadelphia before the American Philosophical Society (APS), he had been serving as vice president under John Adams for a few days, as well as being president of the APS. It is not usual to find a president signing a scientific paper, but neither was Jefferson a usual politician. From his student years he had always shown a keen interest in science. During his time at the College of William & Mary in Williamsburg, Virginia, his teacher William Small introduced him to the work of figures such as Isaac Newton, John Locke and Francis Bacon, for whom the future president would profess great admiration. “Even though he was not a “practicing scientist” in the modern sense (i.e. he was not earning his livelihood through his scientific research), Jefferson was passionately interested in the subject,” says Robert McCracken Peck, Curator of Art and Artifacts and Senior Fellow, Academy of Natural Sciences of Drexel University in Philadelphia, which houses the majority of Jefferson’s collection. But undoubtedly his star work was that of the megalonyx bones discovered by miners during the extraction of nitrate in a cave in Greenbriar County and sent to Jefferson by his friend Colonel John Stewart and by a certain Mr. Hopkins of New York, who had visited the cave. As reflected in his study, Jefferson did not believe that these animals had become extinct, but continued to dwell in remote parts of North America. In fact, he did not see those pieces as fossils, but simple bones. “When he sent Lewis and Clark west to inventory the new Louisiana Territory and try to find a water route to the Pacific, he gave the explorers lots of scientific assignments to carry out during their travels,” Peck explains. Among those tasks was the search for mastodons; and also, of course, that terrible giant lion. But naturally, Lewis and Clark did not find the megalonyx during their expedition to the Pacific coast. 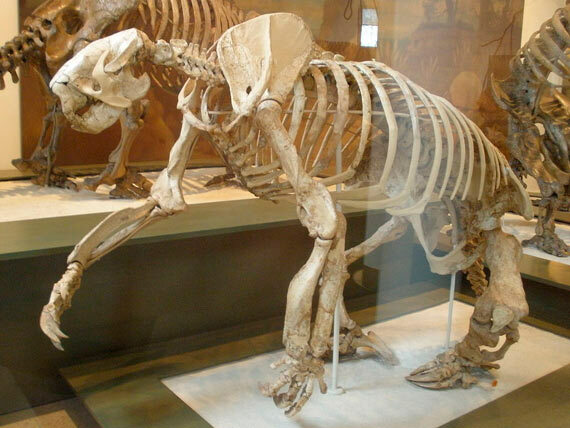 In an footnote to his study, Jefferson recorded that he had known of a prehistoric sloth whose size and bones were similar to the megalonyx, called Megatherium by the French naturalist Cuvier, and whose remains, found in the Rio de la Plata, had been sent to Madrid. However, Jefferson clung to the idea that they were different animals. 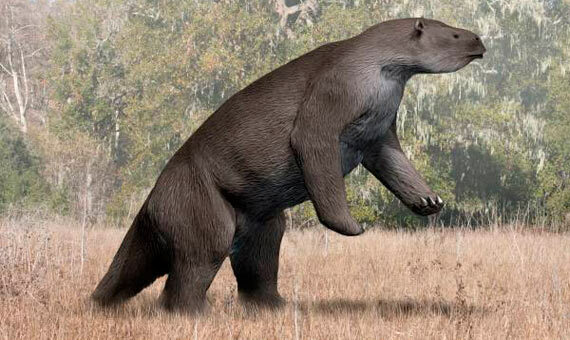 Jefferson’s creature would continue in the limbo of the zoological classification until 1822, when French zoologist Anselme Gaëtan Desmarest concluded that it was a giant terrestrial sloth similar to the megatherium, naming it Megatherium jeffersonii in honour of its discoverer. Three years later, the American naturalist Richard Harlan reassigned it to a different genre, retrieving the original name chosen by Jefferson: Megalonyx jeffersonii. “While the field of Palaeontology would change dramatically and become much more sophisticated later in the 19th century, Jefferson’s early involvement in the field was quite significant,” says Peck. “He was attacked by his political opponents in the U.S. for being interested in science, but in the scientific community he was well respected, both for his own research, and for the support he gave to others through the APS and through the Federal government.” As Professor Keith Thomson wrote, the curious paradox of the man who is often considered the founder of vertebrate palaeontology in North America is that he did not believe in its two basic premises: fossils and extinction. But Jefferson did believe in science; that which, he wrote, had as its object the freedom and happiness of the human being.